- Tactical performance that stows easily in a pocket, on your tactical vest, or lashed to your web gear, the Hunting Knife from Pro Iron always stays ready. This durable utility lockback folder features a 3-1/4'' partially serrated blade made of 440 stainless steel with a protective black oxide coating, makes a survival tool in wilderness. Ambidextrous thumbstud and opening assist lever make opening the blade easier, while the reliable liner lock holds the blade out securely when you are ready to use it. This makes an excellent tactical knife or Camping knives. 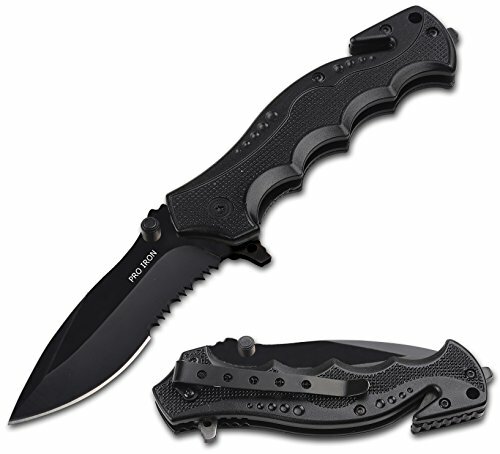 Knife also features a glass breaking point and has a built-in seat belt cutter, deep carry pocket clip. Make This The Last Outdoor Survival Camping Hunting Knife You'll Ever Buy - We stand by our products and will work hard to find a positive solution.